As the weather begins to warm, work on the sanctuary gets easier. Snow and ice are melting. We’ve taken the blankets off the horses and left the doors/windows on barns open overnight. Turkeys and deer are looking for food on the newly visible ground, causing the dogs to bark all day and night. This week, Millie, a 23 year old Welsh pony arrived at the sanctuary. She immediately bonded with Pippin, our 30 year old Welsh pony. Amber and Sweetie hang out on one side of the large paddock, Millie and Pippin on the other. Everyone is getting along well. Millie’s arrival was a bit rocky. 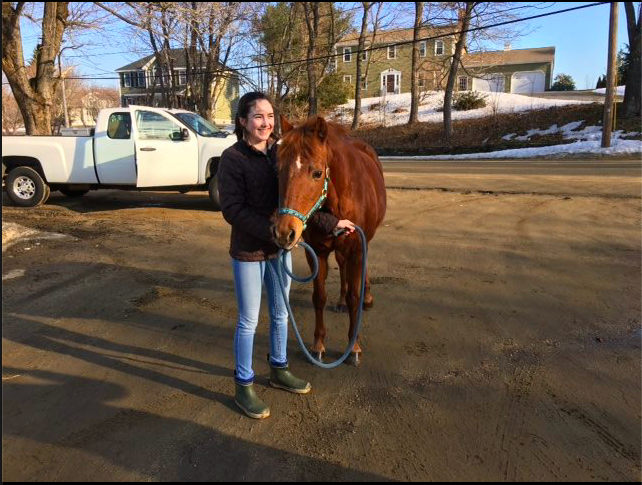 Her owner drove Millie from Central Massachusetts to Unity Sanctuary and one mile from us, the diesel truck pulling the horse trailer just stopped. Nearby police arrived to direct traffic and Millie was safely removed from the trailer and walked down a side street. One of our neighbors, the Dowse family, saw the problem and immediately came to the rescue, hauling the trailer out of harm’s way and to the sanctuary. The truck was towed back to Central Massachusetts and a mechanic found fuel line failure. Now that the floors and walls of the sanctuary have been refinished, we’re in full swing with classes and meetings. Here’s a glimpse of our efforts to restore colonial colors to every room. Friday yoga meets in the third floor loft of Unity Hall. Sunday drop in meditation meets in the great room on the first floor of Unity Hall. Retreats are scheduled for March. The commercial-grade heating, plumbing and electrical systems are ready for them. My nights and weekends (when not at HIMSS) have been spent on carpentry, window repair, and furniture refinishing. At this point we’re completed our search for 1800’s furniture in local basements, attics and even the town dump. Here’s what it all looks like. This weekend, Penny the Yorkshire pig arrives we’ll begin the process of socializing her into the herd. She’ll need extra reassurance since this will be the first time she’s left her mom/dad and the comforts of her home. We’ll keep her safe for a year, hoping that she’ll return to her “parents” once they’ve found a new place which a dedicated pig habitat. We'll work on trails, paddock planning, and recovery from the past 4 months of below freezing weather.